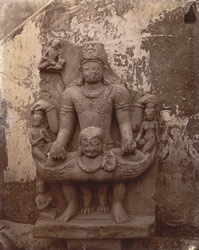 Sculpture of Vishnu riding on Garuda, Bihar Museum. bl.uk > Online Gallery Home	> Online exhibitions	> Asia, Pacific and Africa Collections	> Sculpture of Vishnu riding on Garuda, Bihar Museum. This photograph of Vishnu riding Garuda in the Bihar museum was taken by Joseph David Beglar in the 1870s and is part of the Archaeological Survey of India Collections. A note by Bloch reads, "The sculptures photographed while exhibited in the Bihar Museum were collected from various places in Bihar, and are now in the Indian Museum. A paper by Mr Broadley, dealing with this collection, was published in Journal of the Asiatic Society of Bengal, vol. XLI, part I, 1872, pp. 209-311." Garuda is the king of the birds and is one of the three principal animal deities in the Hindu pantheon alongside the elephant headed Ganesha and the monkey god Hanuman. He is the charger of Vishnu and the two are often depicted together. Vishnu is also an important god in the Hindu pantheon as he is the preserver of the universe.